Hehe, I'm in a HUGE 3D kick lately. Trying yet again to make a full Starmaninjian body. Since I more or less finished feral Kao, I decided to try again at anthro Kao. Gosh, I'll tell you, making the body from scratch is a HUGE pain. 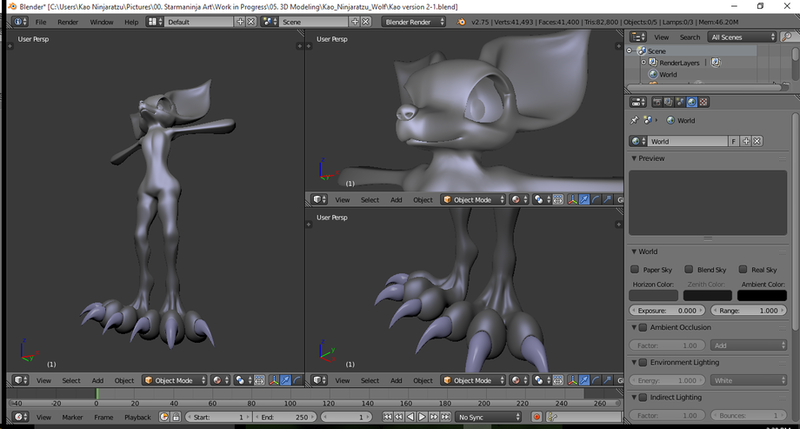 I used the old method to make the feet though, where I made the toes using sphere primitives that I edited, stitched them together to make the rest of the foot and then attached it to the body I made. Attaching it was a HUGE pain, but here's how it looks so far. I'll keep working on it as time moves on. I gotta fix the hips and legs so they don't look very bony and I'm trying to figure out a better way to make the eyes so it looks a bit smoother. Also, fun fact, I've been keeping track of how long it takes me to make these. It seems provided I don't run into any hiccups, it takes about 6 or so hours to make a decent model. Typically 2 days worth (espeically since I've already made the head, saving me TONS of trouble.) As I keep practicing, I'll look into making something a bit more versatile, but as it turns out, even in 3D, I just can't escape making the Starmaninjians MY way. Hehe.